Technology is helping people who suffer from a disease that effects nearly one in ten Americans– diabetes. Affecting over 400 million people, diabetes is one of the fastest growing epidemics worldwide. Diabetes is a condition in which the body is unable to regulate its glucose level. This means that those who are living with the disease must take on that job. There is a lot that goes into maintaining healthy levels such as medication adjustments, dietary needs and proper exercise. FreeStyle Libre is revolutionizing the way those with diabetes monitor their glucose levels. 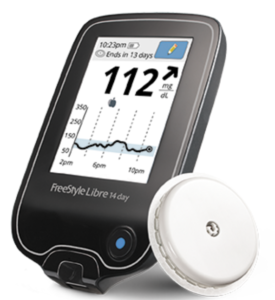 Instead of the painful finger sticking method, the FreeStyle Libre uses a sensor that can be placed discretely on the back of the arm that the monitor picks up all information from with one sweeping motion. Managing glucose levels has never been easier or more accurate. The monitor also tracks glucose trends so that users are aware of the direction that their levels are headed. FreeStyle Libre is the perfect method to take control of diabetes, and the technology is only getting better. For more information, check out the segment below to see just how easy the FreeStyle Libre is to use and learn more about how this new technology is making big changes!